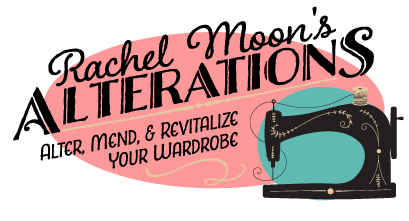 I am a women's only alterations boutique. This includes any pants hem where you can see the stitching. An original hem is usually done on designer jeans. The hem that the manufacturer created is moved up to shorten the length of the jean. The effect is such that it looks as if nothing was done to the jean. Typical hem used on dress pants. Stitches are not seen. Pricing is determined based on manufacturing, fabric, and style of top. Pricing is determined based on manufacturing, fabric, and style of sleeve. Pricing is determined based on manufacturing, fabric, and style seams. Pricing is determined based on manufacturing, fabric, and style. Pricing is determined based on manufacturing, fabric, and style. I do not offer this service for down jackets or leather jackets. I do not offer shoulder alterations on blazers, jackets, or coats. Pricing determined by size of repair, type of fabric, and number of repairs to garment. 24 hour turn around: Twice the price. 48 hour turn around: The price plus half. Under a week: The price plus a third. I do not currently offer same day turn around on most alterations. * Appointment fees are applied if you come in for an appointment and decide to take your alterations elsewhere. ** Measurements fees are applied to appointments made to get measurements done for shopping online. Bridal alterations- I require a two month window to perform alterations on bridal gowns. The fee for bridal under two months is $100 added to the price of alterations. There is a fee schedule for bridal coming in under a month posted in the under a week fees page. Custom, contract, and upcycling projects are charged hourly. The rate is $60/hr. I accept credit cards on all orders over $50.